After launching the 6,000 Years of Murder ebook last month, we had an overwhelming response, with loads of new people signing up to the Tim+Alex Patreon and pushing us past our stretch goal to produce ebooks on a monthly basis. …And lo, our July ebook is here! 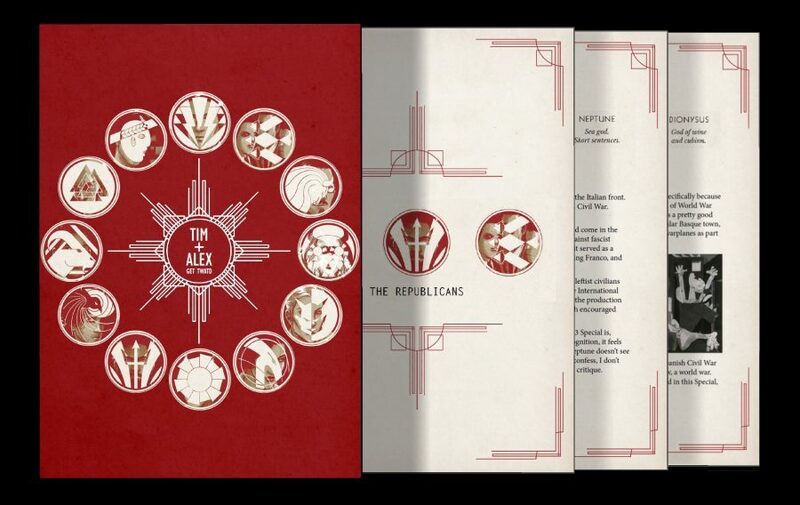 We’ve collected together all Alex’s guides to The Wicked + The Divine‘s 1920s Pantheon and their real-life counterparts, along with a brand-new essay on Persephone’s inspiration by Tim. It’s all wrapped up in a handsome package that is one big homage to Sergio Serrano’s superlative design in the 1923 Special. The eBook is available to all Patreon subscribers – meaning all you need to pledge to access it is $1 a month, which will let you download both our ebooks so far, and all future ones. Download the TWATD 1923 ebook here.